Benjamin Disraeli was born Jewish and is therefore sometimes considered Britain's first Jewish Prime Minister. In fact, he was a practicing Anglican. In 1813, his father's quarrel with the synagogue of Bevis Marks led to the decision in 1817 to have his children baptized as Christians (ironically, when Disraeli was 13 and eligible for Bar Mitzvah). Until 1858 Jews were excluded from Parliament; except for the father's decision Disraeli's political career could never have taken the form it did. Benjamin Disraeli, was born in London on 21st December, 1804. His father, Isaac Disraeli, was the author of several books on literature and history, including The Life and Reign of Charles I (1828). After a private education Disraeli was trained as a solicitor. Like his father, Isaac Disraeli, Benjamin took a keen interest in literature. His first novel, Vivian Grey was published in 1826. The book sold very well and was followed by The Young Duke (1831), Contarini Fleming (1832), Alroy (1833), Henrietta Temple (1837) and Venetia(1837). Benjamin Disraeli was also interested in politics. In the early 1830s he stood in several elections as a Whig, Radical and as an Independent. Disraeli's early attempts ended in failure, but he was eventually elected to represent Maidstone in 1837. Disraeli's maiden speech in the House of Commons was poorly received and after enduring a great deal of barracking ended with the words: "though I sit down now, the time will come when you will hear me." Disraeli was now a progressive Tory and advocated triennial parliaments and the secret ballot. He was sympathetic to the demands of the Chartists and in one speech argued that the "rights of labour were as sacred as the rights of property". In 1839 Benjamin Disraeli married the extremely wealthy widow, Mrs. Wyndham Lewis. The marriage was a great success. On one occasion Disraeli remarked that he had married for money, and his wife replied, "Ah! but if you had to do it again, you would do it for love." After the Conservative victory in the 1841 General Election, Disraeli suggested to Sir Robert Peel, the new Prime Minister, that he would make a good government minister. Peel disagreed and Disraeli had to remain on the backbenches. Disraeli was hurt by Peel's rejection and over the next few years he became a harsh critic of the Conservative government. In 1842 Disraeli helped to form the Young England group. Disraeli and members of his group argued that the middle class now had too much political power and advocated an alliance between the aristocracy and the working class. Disraeli suggested that the aristocracy should use their power to help protect the poor. This political philosophy was expressed in Disraeli's novels Coningsby (1844), Sybil (1845) and Tancred (1847). In these books the leading characters show concern about poverty and the injustice of the parliamentary system. Disraeli favoured a policy of protectionism and strongly opposed Peel's decision to repeal the Corn Laws. This issue split the Conservative Party and Disraeli's attacks on Peel helped to bring about his political downfall. In 1852 Lord John Russell, the leader of the Whig government, resigned. Lord Derby, the new Prime Minister, appointed Disraeli as his Chancellor of the Exchequer. This period of power only lasted a few months and Derby was soon replaced by the Earl of Aberdeen. Lord Derby became Prime Minister again in 1858 and once again Disraeli was appointed as Chancellor of the Exchequer. He also became leader of the House of Commons and was responsible for the introduction of measures to reform parliament. In February, 1858, Disraeli proposed the equalization of the town and county franchise. This would have resulted in some men in towns losing the vote and was opposed by the Liberals. An amendment proposed by Lord John Russell "condemning this disfranchisement" was passed by 330 to 291. In 1859 Lord Palmerston, became Prime Minister, and Disraeli once more lost his position in the government. For the next seven years the Liberals were in power and it was not until 1866 that Disraeli returned to the cabinet. Once again, Lord Derby appointed Disraeli as his Chancellor of the Exchequer and leader of the House of Commons. Some members of the Liberal Party, including the new leader, William Gladstone, had been in favour of legislation that would have extended the franchise. His attempts to obtain parliamentary reform failed but Disraeli was convinced that if the Liberals returned to power, Gladstone was certain to try again. Benjamin Disraeli argued that the Conservatives were in danger of being seen as an anti-reform party. In 1867 Disraeli proposed a new Reform Act. Lord Cranborne (later the Marquis of Salisbury) resigned in protest against this extension of democracy. In the House of Commons, Disraeli's proposals were supported by Gladstone and his followers and the measure was passed. The 1867 Reform Act gave the vote to every male adult householder living in a borough constituency. Male lodgers paying £10 for unfurnished rooms were also granted the vote. This gave the vote to about 1,500,000 men. The Reform Act also dealt with constituencies and boroughs with less than 10,000 inhabitants lost one of their MPs. The forty-five seats left available were distributed by: (i) giving fifteen to towns which had never had an MP; (ii) giving one extra seat to some larger towns - Liverpool, Manchester, Birmingham and Leeds; (iii) creating a seat for the University of London; (iv) giving twenty-five seats to counties whose population had increased since 1832. In 1868 Lord Derby resigned and Benjamin Disraeli became the new Prime Minister. However, in the 1868 General Election that followed, William Gladstone and the Liberals were returned to power with a majority of 170. After six years in opposition, Disraeli and the Conservative Party won the 1874 General Election. It was the first time since 1841 that the Tories in the House of Commons had a clear majority. Disraeli now had the opportunity to the develop the ideas that he had expressed when he was leader of the Young England group in the 1840s. Social reforms passed by the Disraeli government included: the Artisans Dwellings Act (1875), the Public Health Act (1875), the Pure Food and Drugs Act (1875), the Climbing Boys Act (1875), the Education Act (1876). Disraeli also introduced measures to protect workers such as the 1874 Factory Act and the Climbing Boys Act (1875). Disraeli also kept his promise to improve the legal position of trade unions. The Conspiracy and Protection of Property Act (1875) allowed peaceful picketing and the Employers and Workmen Act (1878) enabled workers to sue employers in the civil courts if they broke legally agreed contracts. 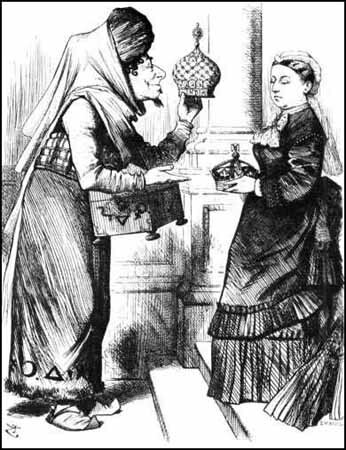 Unlike William Gladstone, Disraeli got on very well with Queen Victoria. She approved of Disraeli's imperialist views and his desire to make Britain the most powerful nation in the world. In 1876 Victoria agreed to his suggestion that she should accept the title of Empress of India. In August 1876 Queen Victoria granted Disraeli the title Lord Beaconsfield. Disraeli now left the House of Commons but continued as Prime Minister and now used the House of Lords to explain his government's policies. At the Congress of Berlin in 1878 Disraeli gained great acclaim for his success in limiting Russia's power in the Balkans. The Liberals defeated the Conservatives in the 1880 General Election and after William Gladstone became Prime Minister, Disraeli decided to retire from politics. Disraeli hoped to spend his retirement writing novels but soon after the publication of Endymion (1880) he became very ill. Benjamin Disraeli died on 19th April, 1881.